You and me? We're finished, we're through... IT'S OVER. It's not you, it's me... I've got itchy feet and it's time to move on. I have met a new bear you see, and I'd like to get to know him better. I hope you understand and I hope that you will soon meet someone else who will take care of you as I once did. I'll never forget you Big Ted..."
... Tee-hee, sorry - I just couldn't resist! Well, this has been one of the most frustrating paintings I have ever had to photograph, which is why it has taken such a long time to actually post it on my blog! Dad and I tried all sorts of ways to get it right, but even now it doesn't show the colours and tones as they truly are, but - it is the closest I can get and I think it's close enough! In reality there are more cooler colours within the fur, like those rich yellows and greens you see on the Beethoven music cover he is sitting on. So, the bear is actually a little lighter than this. There is also a more obvious difference in tone too - Oh, and that blue tinge in the top right hand corner is just light reflecting off of the darkness. Oh well, you get the idea! By the way, I haven't painted the same wallpaper as was in my last bear painting. That was a Victorian pattern, whereas this is of course a pattern from the Classical era - Well what else could it have been for this particular set up, lol! Once again this is oil on 18" x 22" canvas covered board. I have already sketched out the composition for bear number four and I'll blog that in a few days. I am just sorry this one took so long !! Hi Sandra, I have no words to comment this bear.....just three...is a masterpiece!! BRAVISSIMA!! Ciao. SPECTACULAR, OUTSTANDING AND BEAUTIFULLY DONE!!! i love the warm rich tones, the composition, everything is just perfect. well worth the wait!!! congratulations on an incredible work of art! Anyway frustrations aside he is lovely! 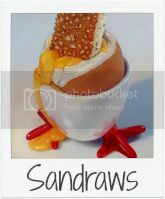 Sandra this is FABULOUS!! I think you have truly found 'your' style with these bears!! I love the colors, and his fur is divine, and that little turn of his head is so endearing. It's simply wonderful!!! :))) And I loved your little conversation with him too. tee hee! Oh, Sandra, but it is wonderful! and I am sure that it is also more beautiful in reality! I love your oils, I find this medium so hard to manage! so I admire your talent so much! and your teddies are so tender and full of life! I like the bear because he is very very very very very fluffy. The violin is a beautiful red. I am RARELY happy with any of my pieces through the camera lense! I even went out and spent some $$ on a great camera. It helped, but it's never great in my opinion. Love your bear! Great piece! Sandra, this is magnificent. I love the rich reds, the angle of the teddy's head ... You really are becoming a Master/Mistress of Teddy Bears!! What a wonderful painting! I can bear-ly control myself about this one ! absolutely stunning. You're quite good at this realism stuff aren't you ;) Not sure you should dump Big Ted, then again I had heard that he's been seen out with Gemima LOL. 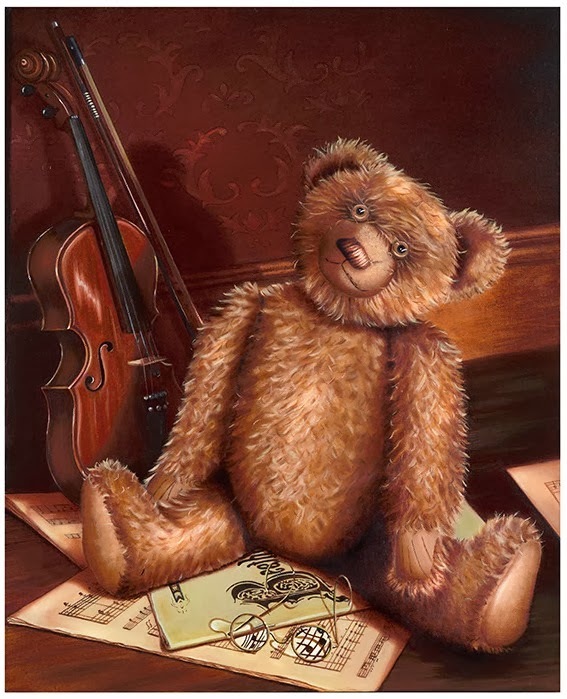 Bear was excellent, the details of the violin, the music, book and glasses, are very well painted. You are hyper-realistic. And do it without losing the spirit of art! You are soooo good, Sandra!! You did an incredible job with this painting. I LOVE IT..CONGRATULATIONS!!! Fantastic!!! as always you blow me away with your gifted talent. Beautiful!! LOVE HIM ...COMPOSITION IS DELIGHTFUL AND WARMTH IS BEAUTIFUL ..YOU'RE GOING TO HAVE A HARD TIME LETTING GO OF YOU BEAR PAINTINGS Sandra !!! Sandra, this is outstanding. I love everything about it, from Ted's glazed expression to the shimmer of light on the violin. 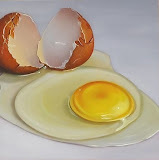 This is an awesome painting - love it!! Fab! Love the staring into space look in Ted's eyes - and the violin, outstanding! Sandra, this is wonderful. You are truly talented. There are many things I like about the painting, but, I just want to touch the bear's left foot. It looks like super soft leather. Keep on, you have a great collection of bears! gorgeous! is this another one that will be in your exhibition! the detail in your work is incredible regardless of the photo, thats clear to see! Ted is fabulous! He has so much character and, well, how could you leave him? I don't think that will be possible with the look he has on his face. In any event, I want to say how beautifully I think you have done on this painting. The violin is especially captivating, too! It is all such a nice story and so well told. Thank you for sharing it. Kindly, Sandy.